The geographic information system (GIS) has been created by merging the OSI and OSNI townland databases to make one all-Ireland dataset. 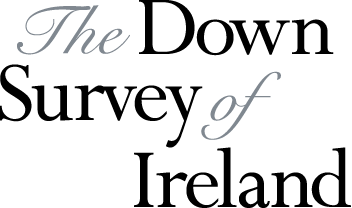 The Down Survey has been geo-referenced in its entirety to find the modern equivalent of every townland recorded in the survey. We can now determine the exact location of each of the place names mentioned in 17th-Century sources. The Books of Survey and Distribution comprise lists of all landowners in Ireland in 1641 and 1670, and a list of the townlands which they owned. This source has been geo- referenced in its entirety. 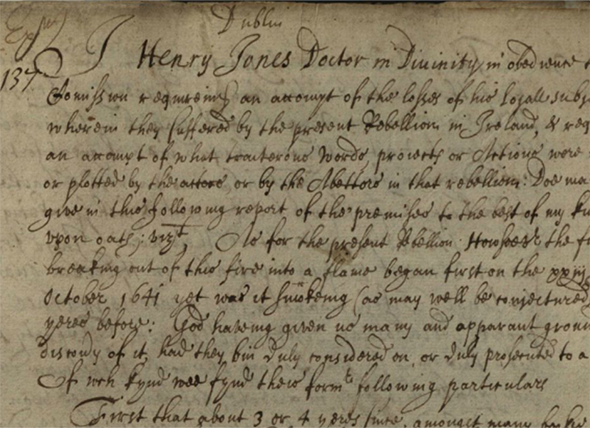 The 1641 Depositions comprise eye witness accounts of the outbreak of rebellion in Ireland and the atrocities alleged to have been committed by Catholics against Protestants. The locations of the murders alleged to have taken place in Ulster as related in the 1641 Depositions have been included in the project. 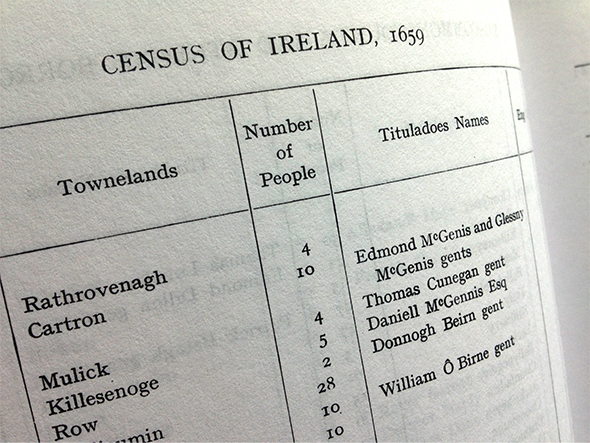 The 1659 Census records the population of each townland in Leinster, Ulster, Munster and parts of Connaught. The county maps, and General Map of Ireland used on this site are from the earliest proof copy of Hibernia Delineatio, the first county atlas of Ireland dating from 1660-1675, now in the Bibliotheque National de France. This version of Hibernia Delineatio was used as a wall map, in that the maps of each county have been engraved to the same scale to ensure they fit and can be mounted together. 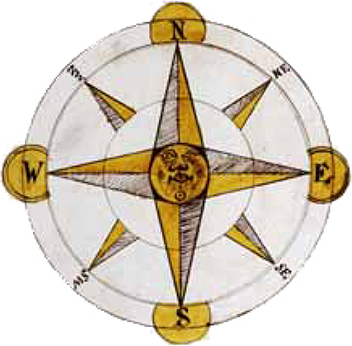 The provincial maps are arranged in the same manner and this atlas is one of only three surviving copies, but the only one in colour. In paper form, this map measures some 2.4 square meters. A composite of these county maps forms the Down Survey overlay in the GIS area of this site. The one inch to one mile (1:126,000) edition of the Ordnance Survey of Ireland was published from the 1860s on 205 sheets. It was intended to be a more accessible set of maps than the six inch to one mile (1,500 sheets) or the original 25 inch to one mile (15,000 sheets) editions. The 205 sheets have been digitized and joined to form a seamless map of Ireland. The late 19th-Century maps were chosen to provide a bridge between the Down Survey and the modern topographical maps and satellite images derived from Google Maps and Google Earth. Of the several sets of the Books of Survey and Distribution that survive, the Quit Rent Office set kept at the National Archives of Ireland is the source for the Land Owners database that forms the core of this site. This set was the ‘official set’, used for the purposes of collecting the Quit Rent, or land tax, from the time of the Down Survey until the 1950s. 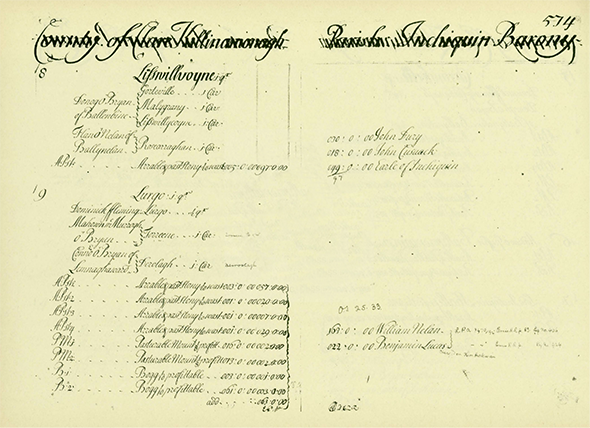 The 1659 census is a 17th-century poll tax record, listing all persons over the age of fifteen years. The census is organised like the Down Survey by county, barony, parish and townland. The census lists the number of people, men and women, resident in each townland, dividing them into groups of ‘English’ and ‘Irish’. The meaning of these groups is contested – whether it is based on religious, ethnic or linguistic grounds. The census also provides us with a list of ‘titulados’, which appear to be the principal tenants in each parish. The census, edited by Séamus Pender, with an introduction by William J. Smyth, was published by the Irish Manuscripts Commission in 2002.